All these steaks are quick and easy to cook; simply pan fry or grill to your liking. They go well with different sauces; many of which you can purchase from the extensive range within our shop. Fillet Steak is often considered to be the best, particularly by my wife, it is the most expensive of the steaks on offer also the most tender but possibly not the most flavoursome. Cut from the other side of the ribs from the sirloin, this muscle does very little work, so it’s very lean and tender. Ideal for impressing your family and friends at a dinner party. Perfect with a peppercorn, mushroom or blue cheese sauce. If you’re on a budget a Rump Steak won’t break the bank, it’s a cheaper cut but rich and flavoursome. This cut is taken from the rump muscle at the top of the hind-quarter and is of medium tenderness. This steak works well with a mustard or peppercorn sauce. The Cote de Boeuf is a French trimmed cut of beef rib, characterised by its natural fat covering and succulence from being matured and cooked on the bone. Seal in a pan on both sides and then finish off in a hot over for 10-15 minutes. Perfect for dinner parties and special occasions. One rib will serve two. Serve with Bearnaise sauce and French fries. 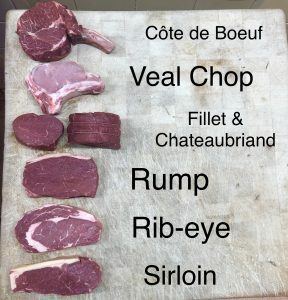 A Veal Chop is leaner and more tender than other cuts of beef. It has a subtle and milder flavour. Add any sauce to make this an interesting and delicate dish. The Rib Eye has wonderful marbling; the natural fat (the ‘eye’) keeps the meat succulent, rich and flavoursome. Keep it simple with some chips and salad. The classic Sirloin Steak never fails to deliver. It’s cut from the loin and is perfectly marbled to keep the steak tender and juicy. Serve with a rich Bearnaise sauce. Medium to high tenderness. Still can’t decide? Then please give us a call or pop into the shop for more advice from our friendly team of butchers. Just the best quality you can wish for.